Major League Soccer's top executive said he is "uncertain" the sport's English superstar David Beckham will stay with Los Angeles Galaxy given the financial lure to join French club Paris St Germain. "I hope he remains in Major League Soccer and continues his career in the United States; sitting here today I'm not sure that that will happen," said MLS Commissioner Don Garber, speaking in New York at Reuters Global Media Summit. Beckham is at the end of a lucrative five-year contract, which made him the highest paid player in the league. His average annual compensation during his contract was $6.5 million. 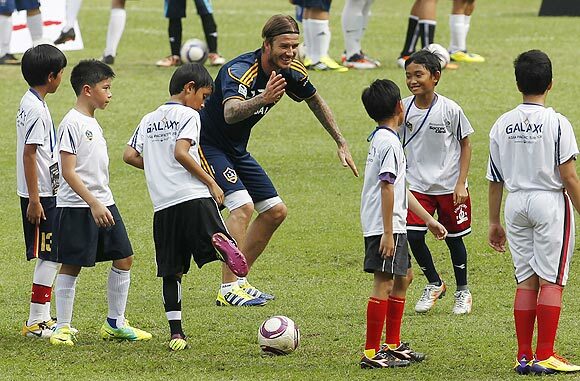 Beckham's team, the LA Galaxy, won the MLS Cup championship earlier this month. Garber said he spoke to Beckham at length after the game but it was down to his talks with LA Galaxy owners. Beckham, arguably the biggest star to play the game in the United States since Brazil's Pele signed in 1975, has said he would make a decision once the MLS season concluded. Paris St Germain, which is backed by a wealthy Qatari owner, has reportedly offered Beckham an 18-month deal worth roughly $17.9 million, according to English tabloid The Daily Mail. Beckham has shouldered high expectations since agreeing to join the MLS five years ago, and the relationship between star, league and fans has run into rough spots along the way. But the 2011 season was seen as a validation of the experiment, with Beckham playing well and the LA Galaxy winning the title. "It's been a great five-year experience for us, he's delivered on all the expectations that we've had," said Garber, who was named commissioner in 1999 after spending 16 years in the NFL's front office. Meanwhile, the league is continuing to expand its roster of teams in the United States and is currently looking to add a second soccer team in the New York City area to join the New York/New Jersey Red Bulls, Garber said. "We are working closely with the city, trying to find sites to build the stadium, I think it will be a record franchise fee paid for that team," he said.